Editor’s note: Eagle County residents Dennis Jones and Yolanda Marshall are traveling in Europe. This is the first story in a series about their trip. Admittedly, six nights is dismally inadequate for Portugal. It is a country whose archeological history stretches back 30,000 years – a lush, varied land settled by the Phoenicians, Romans, Visigoths and Moors. A month should be a minimum. For various reasons, though, Yolanda and I have a limited amount of time before traveling to southern France. Portugal has an entire western and southern coastline to explore, replete with isolated beaches, cliffs and ancient, languid towns. Mountains rise to the Spanish border only 175 miles from the western coast. More important to us, though, is Portugal’s cultural heritage, a unique conglomeration of Roman, Moorish, Spanish, English and Catholic influences. Lisbon is a bustling, cosmopolitan capitol city. From its broad, tree-lined avenues to the tiny, twisting alleys of hilly Alfama, Lisbon is a delight to explore. Buy a 4 Euro day pass on Tram 28, and rattle up and down the hills of Alfama and the Barrio Alto for a day. Hop on and off to take in the viewpoints, eat at sidewalk cafes, experience the calm of centuries-old churches or explore the ancient castle sitting atop Alfama. From Lisbon’s vast Tejos River estuary, Portuguese explorers embarked on their journeys of discovery. They opened Africa, India, Ceylon, Indonesia, China and Japan to European commerce. Other Portuguese happened upon South America, establishing the vast holding that would become Brazil. For us, the attraction of big cities pales to that of small towns, especially towns with an architectural heritage so interesting and fantastic as that of Sintra, a half-hour train ride from Lisbon. 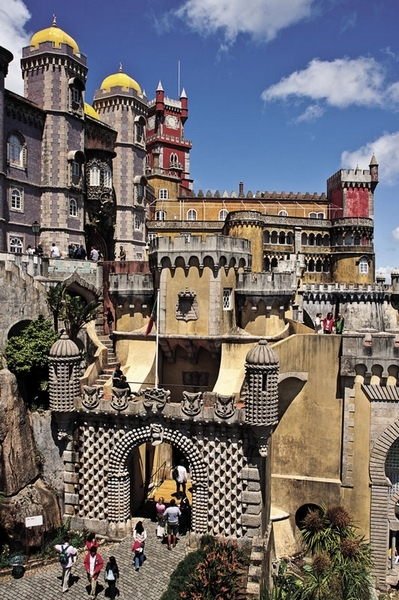 Sintra is a UNESCO World Heritage Site, a romance of hills, narrow, cobbled lanes, lush vegetation and art. The ancient stone walls and towers of a Moorish castle and the somewhat preposterous Palacio de Pena loom on hilltops high above the town. Incredible palaces and mansions, some now hotels, peek through the dense foliage of the hillsides. We spend one amazing afternoon exploring the most fantastical Palacio Regaliera, designed by an Italian architect and opera set designer who devoted 14 years to creating a mythical landscape. Surprises lurk around every turn of the many paths: fountains, caves, grottos, waterfalls and towered, stone fortresses. We descend the spiral stair in the wall of the 120-foot-deep Initiatic Well to its mosaic floor and find dark caverns leading various directions. I imagine pseudo-mystical ceremonies played out by torchlight, operatically staged for the guests’ benefit. The following day, we ascend to the mountaintop aerie of Palacio de Pena. The panoramic views are breathtaking. A lush canopy covers the trails throughout the extensive estate. Beautifully designed surprises appear as we hike. Not yet exhausted, we climb to the thousand-year-old Moorish Castle, whose high ramparts encircle the neighboring mountaintop and clamber up and down the dizzying heights of the steep, ancient, uneven steps lining the serpentine walls. The next morning, we hop an early train to Lisbon to catch an express train to the Algarve, Portugal’s southernmost province. Arriving in Faro, the Algarve’s capitol, just after noon, we find a clean, large room in a small hotel for 40 Euros, about $60. After lunch at a sidewalk cafe, we begin exploring. There’s not a cloud in the brilliant, azure sky. Numerous storks nest on the chimneys, roofs and belltowers above the sun-washed streets of the walled old quarter. Faro is not directly on the coast but situated on an enormous estuary of sand islands. The barrier islands form the Parque Natural da Ria Formosa. Seafood is plentiful, fresh and inexpensive. The people at the tourist office suggest we spend our final day in Olhao, 15 minutes down the coast. We hop a bus. A couple of Euros gets us to the center of town. After wandering the twisting pedestrian streets of the old city, we emerge at the waterfront and Olhao’s large fish market. Several touts try to sell us boat tours of the islands and a fishing village, Culatra, for 30 Euros, $45. The ferry to Culatra, though, costs but 2 Euros. Only fishermen and their families can live in Culatra. There are no cars, only narrow sidewalks separating the low houses. A few restaurants cater to the tourists. Being the offseason, Culatra is exceptionally quiet. After strolling between the houses, we find a boardwalk across low, vegetation-covered dunes emptying onto a beach deserted but for one couple. Far, far beyond the horizon lies Africa. Yolanda and I walk the beach, wading in the now-cold Atlantic, eager to return to Portugal for much longer than a pathetic six nights. To see more photographs and extended stories, visit http://www.dreamcatcherimaging.com/blog.